The new affordable Merlin HD offers high definition color and contrast, resulting in a beautiful crystal clear picture with vibrant colors. Let Dr. Richman show you what makes Merlin HD the greatest value and best picture quality available in desktop magnification. Merlin HD’s camera technology produces an even truer, more natural image. See for yourself what makes Merlin HD the greatest value and the absolute best picture quality available in desktop video magnification. The Merlin HD with the addition of a HD feature pack, offers the ability of horizontal line markers. These line markers provide a reference point when reading. See the difference today! 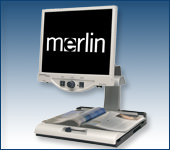 The Merlin HD with the addition of a HD feature pack, offers the ability of horizontal windowing. This feature allows you to totally isolate the text you are viewing for complete legibility. 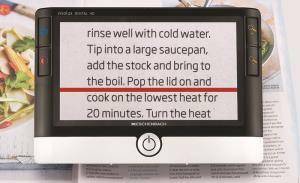 The Amigo, your one of a kind video magnifier on the go, is light and simple to use. Just place it directly on your reading material and adjust the magnification with an easy turn of a dial. Read price tags, menus, medication labels and more any time, any place. The Only HD Hand-Held Magnifier You’ll Ever Need! The device’s unique Dynamic Line Scrolling (DLS) feature allows the user to scroll side to side on the screen in higher magnification levels without having tomove the device. Its HD camera actually sees more than what’s shown on thescreen, making reading a book or magazine easier than ever!